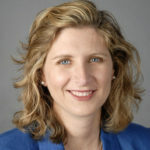 Laura Desimone is an Associate Professor in the Education Policy Division of the Graduate School of Education at the University of Pennsylvania, co-director of Penn GSE’s IES pre-doctoral fellows training program, and director of Penn GSE’s postdoctoral fellows program. She studies how state, district, and school-level policy can better promote changes in teaching that lead to improved student achievement and to closing the achievement gap between advantaged and disadvantaged students. Her research covers three main areas: policy effects on teaching and learning, policy implementation, and the improvement of methods for studying policy effects and implementation. She studies all levels of the system and focuses on three policy areas: standards-based reform, comprehensive school reform, and teacher professional development. Her work has been published in peer-reviewed journals, including American Education Research Journal, Educational Researcher, and Educational Evaluation and Policy Analysis, and has been supported by grants from the U.S. Department of Education, the National Science Foundation, and the Spencer Foundation. She earned a B.A. in American Studies from Wesleyan University, MPA with a concentration in Education Policy from American University and Ph.D. in Public Policy Analysis from the University of North Carolina at Chapel Hill.